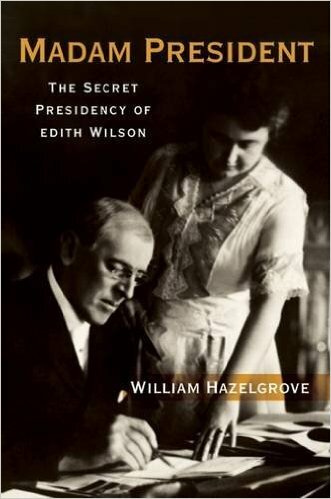 Whenever I do signings for any book I always sell a lot of Madam President The Secret Presidency of Edith Wilson. I start by telling people we already had a woman president. Usually people laugh but then I tell them to go to .gov and read about first ladies because there in Edith's bio is the statement that she ran the executive for two years. She did. It was a great cover up of a sitting Presidents inability to govern and his wife taking over and running the United States for two years. Hard to believe really. The next question is how come I don't know this. A lot of history is papered over with mythology. The facts get lost under agendas and historical bias. Historians are loathe to say that Edith Wilson was President. It does not fit in the Wilson historical context. It is also too fantastic to believe. How could this be pulled off? No radio for one thing. Newspapers were the primary source of news and people were not used to seeing the President. A press that was complicit in the cover up. Or at least a press that didn't question. Yet there were papers that did speculate that Woodrow Wilson had a stroke and his wife was running the country. But it didn't get much traction. Then Edith herself made sure her tracks were covered in a 1939 memoir where she said she never made any decisions but was just a steward. None of this is true. The fact is Edith Wilson was the President in 1919 albeit unelected and ran the country until 1921. Believe it or not.